Time flies when you’re having fun, covering all kinds of weather! 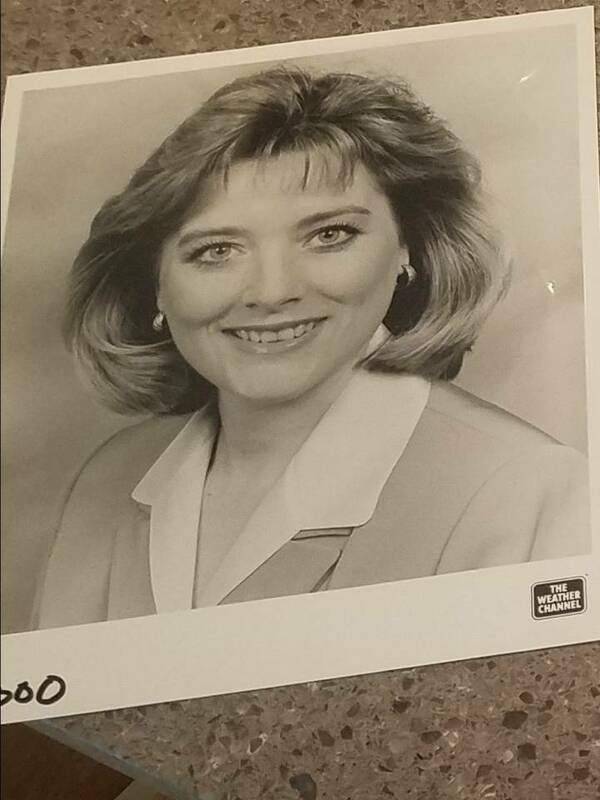 It’s hard to believe I started at The Weather Channel 18 years ago. In that time, I’ve covered big storms like Katrina and Sandy, tornado outbreaks, and big blizzards. In that same time, I’ve also raised 3 kids, adopted a shaggy sheepdog, and traveled many miles to see family. That’s the beauty of this job, being able to work the big weather events, but also have a fulfilling family life. Believe it or not, the decision to come to TWC was not an easy one. In fact, I turned down the first offer! I was content living and working in upstate NY, not far from where I was raised. I was comfortable. But the day I was to sign another contract at my last job, TWC made me a second offer, turning my “comfortable” world upside down. I thought, would I regret not trying something new and different? If I didn’t like it, I could always come “home” right? After many tears and discussion with my husband and family, we decided to give it a try. When I first came to TWC, I was so scared! I was pretty good at forecasting for the northeast, but now I had to brush up on my geography skills for the entire country! What I really loved about TWC from the get go, is that we are like one big weather family. The excitement over tracking big storms and even just the temperature fluctuations on a quiet day, we all geek out together! Before TWC, I knew nothing of NASCAR, college football, or PGA tournaments. Now, we talk about how the weather impacts so many outdoor events. I have learned so much from our experts here at TWC, allowing me to fine tune my meteorological skills. I have seen amazing technological advances to make our forecast even better. The computers we use to display maps have come a long way! In fact, we can use 3-D and augmented reality to better tell our story. And since the weather is constantly changing, the need to tell those stories is still relevant, and even more important today. Thanks to all the viewers and fans who have been with me on this long weather journey! Jim Cantore Named Inaugural Honoree for the Weather Hall of Fame! Do You Understand What 40% Chance of Rain Means? wow I still can’t believe it’s been that long already..I remember back when you started ….I have seen many changes in TWC…Some good some not so good but so glad you are still there… I’ve taken breaks from TWC many times.. I used to watch every day.. now I only watch occasionally but I am still glad to see Kelly Cass come on my screen… Keep up the great work! I LOVE the weather channel I watch it everyday it’s nice to see new things going on with the weather. & how u all get along. My wife asked me one day, why I don’t watch the Weather Channel, when other cast members are on? Real simple, Kelly isn’t on. Kelly never change, always stay the same. God gave you this talent, and a out of this world personality. God bless you. I’ve always been a kelly fan,at all hours of the day and night. You appear to be the super anchor of TWC. I have always enjoyed watching you do the weather…My only regret is that Sharon Resultan left. because of the name change. I have always watched you faithfully and I am so very proud of you all these years. Thanks so much Linda. I still make it to NY every summer to visit! Thanks Arlene! I really appreciate it! Watched Kelly Cass on the local NY station back home so it was neat to see her turn up on the weather channel. Been a fan of her work for a long time! Your detail in forecasts helps me tie together the reasons why I work on weather and climate satellite instruments at NASA. Thanks for your dedication and expertise for the Weather Channel and citizens at large. You are a rock and support to all. turn on TWC at 6:00 every morning–love it., You are one of my favorites—always look beautiful!!!! Congrats Kelly! I have watched TWC almost from it’s inception and glad you made the move! You guys rock!!!! Long time fan. I have watched from the beginning! Glad you stayed with the WC!! Can’t believe I’ve been a fan for that long. Congratulations and can’t picture TWC without you. Thank you! Kelly informing us of 18 years service. I have a sense of foreboding. The exquisite Kelly may not be with us much longer. My mother’s cat is 19 yrs, 4 mos. Doing my utmost to see that she reaches 20. congrats!! you & ‘all you all’ @ the TWC are class acts…. Thank you Kelly you are so awesome and beautiful !!! There is nothing better then getting up turning on the weather channel and seeing you. Congratulations Kelly. I Love seeing you on AMHQ and then on the weekends too. I’m SO happy you made the change and your Husband stood by you through it all. You are a true scientist and trooper. Thanks for being there for ALL of America. Thank You. Congratulations Mrs Kelly Cass: You lovely smile does help the weekend morning to be m ore lively! Of course the same applies no matter what day or shift you are working! Keep up the great work! Computers, Satellites, Cameras, everything used at TWC has had major changes in 18 years, everything except your smile! Congrats Kelly, you have made a difference on how weather is reported. Without you, the TWC would be a little darker without out your shining smile. Obsessed that when I turn on the TV in the morning, my husband has it set to come on to TWC! Thanks for all that you and your o-workers do! Congrats kelly! and I think the you chose the right choice because without you their will be a peace missing of the weather family I hope I can be there at the twc one day to meet you and the rest of you guy well congrats again. Kelly congrats on 18 years, I love your broadcasts and hope to watch you for many more years. My husband & I loved the Weather Channel from the beginning!!! I am a widow now, but am still a weather geek!!! You ladies & gentlemen are like family!!!! Kelly, you are a beautiful lady!!!!! Keep up the great work you do!!! Great story! You do look as young as ever but in my opinion you look better today than you did before. My personal opinion of course! Congrats on your 18th Anniversary! I’ve learned a lot watching the weather channel but one thing you all never say is for instance if your home is all windows except for one hallway that is exposed to the outside by one archway and the other alternative the utility room with all 4 walls but is right next to it is the garage which is with vehicles but is completely shut off from all outdoor areas where do you go during a tornado? The utility room or the hallway? 18 years? It’s been that long? Wow! Congrats! Kelly, your on air comfort is so evident!!! It seems that you ABSOLUTELY Love your job and from my side of the TV screen, you’re fantastic at it!!! I pray you stay on air for 30 more years! If you love what you do for a living, you never have to “work” a day in your life! From my side of the screen, you are the consummate professional! We do see your emotional side in the weather tragedies and that’s perfectly acceptable! You are great at TWC Kelly, and we look forward to any time you are on. Here’s to 18 more great ones! You are one of my favorite favorites! Times fly when you are having fun! Congratulations on your first 18, hope you are still around for another 18! Congratulations Kelly on 18 years @TWC! You are a great meteorologist I enjoy watching you. You’re Awesome! Congratulations Kelly! All the best to you and everyone at TWC! I remember watching Miss Foland every morning on Channel 6 for years, don’t remember how many though. Her smile always brought sunshine to the show even on rainy days, Keep up the good work Kelly. Congrats to you Kelly! Glad you could split your time between career and family so well.You’ve always been a fresh addition to the broadcasts,and we enjoy watching.Did you go to Penn State by any chance?